Travel to the edge of the Okavango Delta and Chobe National Park then onto Luangwa National Park in Zambia to capture unforgettable moments on your camera with professional photographer Tom Murphy. Ride in an open-air Land Cruiser with our expert local guides who are adept at finding leopards, lions, elephants, African wild dogs, giraffes, and other wildlife while positioning the vehicle for the best photographic opportunities. Spend a night at spectacular Victoria Falls – the widest curtain of water in the world. Travel to Mfuwe in South Luangwa National Park – Zambia’s best game area. Relish overnighting in mobile camps in Botswana, staying at a luxurious resort within walking distance of Victoria Falls, and then move into permanent safari tents overlooking the Luangwa River in Zambia. • Feel the pulse of the African bush during carefree mobile camping in Botswana. • Experience an elephant extravaganza along the Chobe River. • Hear the roar of Victoria Falls, the world’s largest sheet of falling water. • Spend four days exploring South Luangwa with concentrated congregations of game animals at the Luangwa River. Aug 4 - 5 Travel to Johannesburg, South Africa. Aug 23 Arrive home, depending on flight schedule. Malama’s extensive knowledge of Zambia’s South Luangwa National Park and of wildlife in general is accompanied by excellent interpersonal skills. He focuses on the interests of each guest–be it birds or other mammals, flowers, or landscapes. You will come away with a deep awareness of this interesting area in Africa. In the morning, you’ll fly from Johannesburg to Maun to catch your charter flight to Moremi Game Reserve in the Okavango Delta. Moremi lies on the eastern extremity of the Okavango Delta and has many types of habitats including wide-open floodplains, marshes, ox-bow lakes, riverine forest, lagoons, papyrus-fringed channels, vast reed-beds of Miscanthus and Phragmites, woodlands, and savannah. 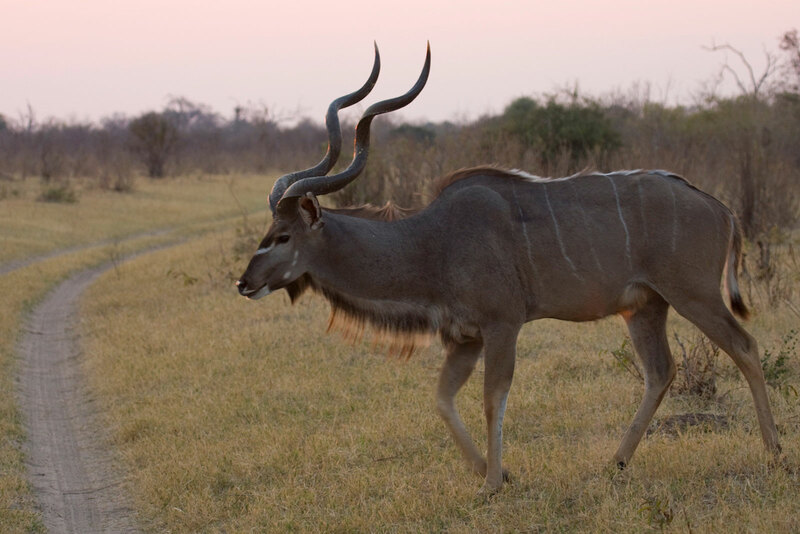 En route to your campsite, discover mopane (pronounced Mo-pa-ni), the dominant tree in the wooded areas, in dense stands that provides a safe refuge for rare, timid, large antelopes, especially greater kudu. You’ll encounter every type of mopane habitat – the towering cathedral woodlands called Xakanaxa (pronounced Ka-kana-ka), the classic climax mopane woodland and, in the drier and harsher habitats, extensive stretches of scrub mopane. Rainfall from the Angola highlands surges 745mi (1,200km) into the Okavango Delta, creating a unique wetland that supports and sustains a huge diversity of wildlife. You’ll have daily morning game drives to search for African wildlife. Moremi Game Reserve is among the best game reserves in Africa for viewing the endangered African wild dog, especially around Xakanaxa. With luck, you’ll also see breeding herds of African elephant or even red lechwe (one of the more unusual antelope species) moving between their browsing areas in the mopane forests and the fresh water of the Okavango. In the afternoons, enjoy a walk in the vicinity of the camp, looking for animal tracks in the sand. Botswana’s sandy foundation is the result of thousands of years of termites turning wood into soil. 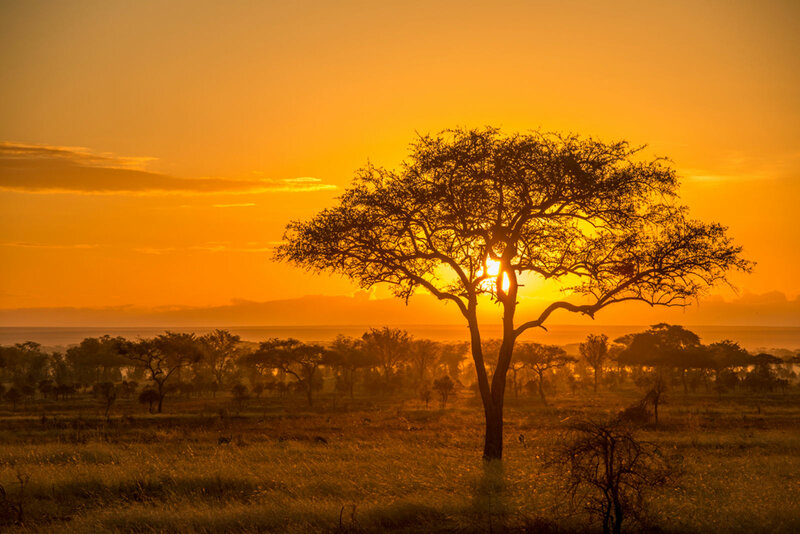 Your afternoon game drives are timed to be in the field for the best light and during the magic hour of dusk to dark when nocturnal animals become active. The Khwai area is the North Gate region of Moremi Game Reserve. You’ll travel to the Manuchira Channel, weaving along from the riverside and floodplains into the mopane veld and the woodlands. You’ll visit the magnificent Dombo Hippo Pools to enjoy the scenery and the antics of the resident hippopotamus. The western mopane veld is home to breeding herds of elephant, while the eastern reaches of Khwai are home to some impressive old bulls. The mature bulls revel in the cool waters of the Khwai and are more approachable while drinking and bathing. 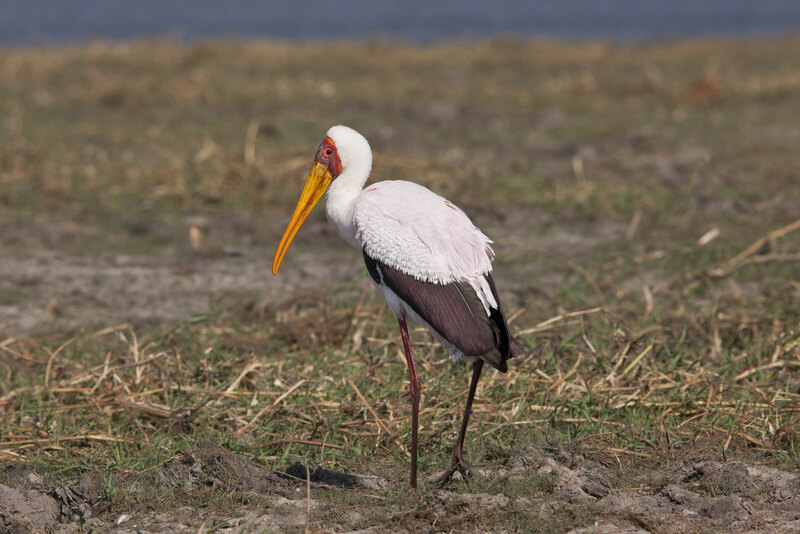 Khwai is a great ecotone area between the contrasting habitats of the marshy backwaters of the Khwai River, the dry-land leadwood, camel thorn woodlands, and savannahs – truly one of Botswana’s birding meccas! 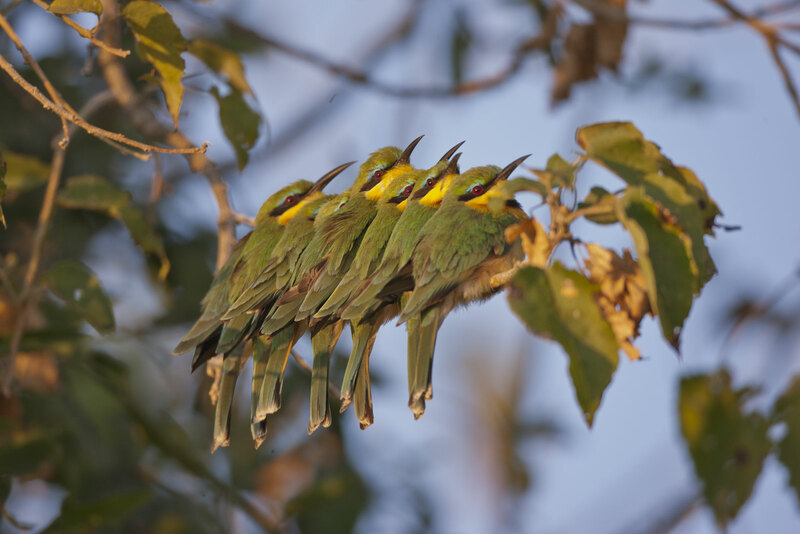 Marula trees, a species of fig that produces the delicious liquor, and giant wild ebony trees shelter outstanding birdlife, such as bat hawks, in the delta that hunt along the entire length of the river. Away from the waterways, we will encounter hornbills, bee-eaters, rollers, starlings, and others. You’ll stop for wildlife along the way from Khwai to Savuti Marsh. You will see the remains of a once vast paleo-lake called Lake Makgadikgadi that dried up some 10,000 years ago. Then, you’ll traverse a winding track through deep sand while crossing the Magwikwe Sandridge that formed the shoreline for this massive inland sea. The old lakebed is now the Mababe Depression, and the dense clay floor of the depression results in high protein food for wildlife after the rains. The Mababe Depression is a birder’s paradise. The nutritious grasses that grow on the rich soils provide excellent seed for an impressive array of estrilids and viduids, such as the village indigobird and shaft-tailed whydah. These birds provide a good food source for small raptors such as the little sparrowhawk, shikra, gabar goshawk, and lanner falcon. Unlike the vast majority of Botswana, the sandy Savuti area is dotted with small rocky outcroppings of volcanic rock amidst the Kalahari sands that provide habitat for a completely different array of small wildlife and plants. The Savuti Marsh has been the stage for many dramatic wildlife documentaries in Africa because of the wide-open country, healthy ungulate populations, and particularly strong lion prides and spotted hyena clans. Your last day in Botswana is spent traveling along the Chobe River. You’ll drive through the stunted mopane scrub of the Goha clay basin, across the sand ridge, through the wonderful Zambezi teak woodlands of the Chobe Forest Reserve, and along the Chobe River floodplain. Take an early morning boat trip on the Chobe River, within the heart of elephant country, where large herds congregate to drink and bathe. Later, you’ll cross the Zambezi River into Livingstone to explore Victoria Falls, one of the Seven Natural Wonders of the World. The spectacular falls are the widest curtain of water in the world and plunge 330ft! Several species of birds, including trumpeter hornbills, do well in the moister forests bordering the falls. Transfer to the nearby Livingstone Airport for your early morning flight to Mfuwe via Lusaka. You’ll meet your Flatdogs Camp guide at the airport when you arrive, and drive to Flatdogs (meaning “Crocodiles”) Camp. Enjoy an afternoon game drive before heading back to camp to for a relaxing evening. South Luangwa is touted by many travel experts (e.g. Lonely Planet, Fodor’s, TripAdvisor) as being one of the greatest wildlife sanctuaries in Africa. The Luangwa River is the most intact major river system in Africa and supports life within the park's 9,050km2. More than 60 mammal species and 400 bird species reside along the river. During night drives in the Luangwa, you’ll have opportunities to see leopards and many other nocturnal animals. You may encounter African civets, common (or small-spotted) genet, spotted hyenas, nightjars, honey badgers (ratels), and lions. On most nights you may hear hyenas and their plaintive, eerie cry ¬– so characteristic of the African bush. The Luangwa River has an extraordinarily high number of Nile crocodiles. At first glance it may look like a floating log, but often times it will be a crocodile basking on the riverbanks or floating down the river. In Luangwa Valley many large water birds wade through the shallows. Yellow-billed storks move with their beaks open underwater, disturbing the muddy water with their feet until the fish flop into their mouths. The striking 1.6m tall saddle-billed stork will make quick darting movements into the water to capture prey. Southern ground-hornbills emit the sound of a deep base drum early in the morning while the melodious white-browed (Heuglin’s) robin-chat and cry of the African fish-eagle are very distinctive against the ever-present cooing of all the resident doves. After a morning game drive, you’ll fly from Mfuwe back to Lusaka for an overnight near the Lusaka Airport or continue on to Kigali, Rwanda to extend your safari on our Mountain Gorilla extension. In the morning, you’ll transfer back to the Lusaka Airport to fly to Johannesburg and connect with flights homeward. Extend your stay in Botswana to visit the famed Makgadikgadi Pans in the Kalahari Desert and visit a meerkat colony. Travel to the edge of the Okavango Delta and Chobe National Park then onto Luangwa National Park in Zambia. Costs are per person, double occupancy, not including airfare (except charter flight from Maun to Moremi and flights in Zambia from Livingstone to Mfuwe and Mfuwe to Lusaka), singles extra. See Included and Not Included sections for more details. All leaders, transport, park entry fees, landing fees, and permits for all activitiesunless described as optional. Charter flight from Maun to Moremi, and flights in Zambia from Livingstone to Mfuwe and Mfuwe to Lusaka. Accommodations for the nights of August 6 through August 21. Meals from dinner on August 6 through breakfast on August 21, plus breakfast on August 22. Drinks while in your private mobile camps and drinking water while on game drives. Airport transfer from Moremi to your mobile campsite on August 6 and airport transfer from Protea Tower Hotel to Lusaka Airport on August 22. Trip Materials –information about flights, packing, entry and departure requirements, airport transfers, gratuities, etc. All airfare (except flights listed as included), airport and departure taxes, and excess baggage fees. Airfare is approximately $1,800 to $2,500 from USA to Maun, Botswana and from Lusaka, Zambia to USA. Lunch and dinner on August 21. We can arrange divergent airport transfers and extra hotel nights for an additional cost. Accommodations, transfers, meals, and any other arrangements in Johannesburg, South Africa. Gratuities – tipping is, of course, discretionary, however we suggest budgeting about $20 per participant per day for August 6 to 21 with our guides and camp staff (about $320 total per participant). Daily temperatures in July and August can vary between below freezing (32°F, 0°C) and up to around 85°F (29°C) during the day with the possibility of some rain. In the last five years, the dynamics of climate change have been impacting the area by increasing overall temperatures. Dressing in layers is the best way to deal with the varying temperatures. Minimal fitness level is required. 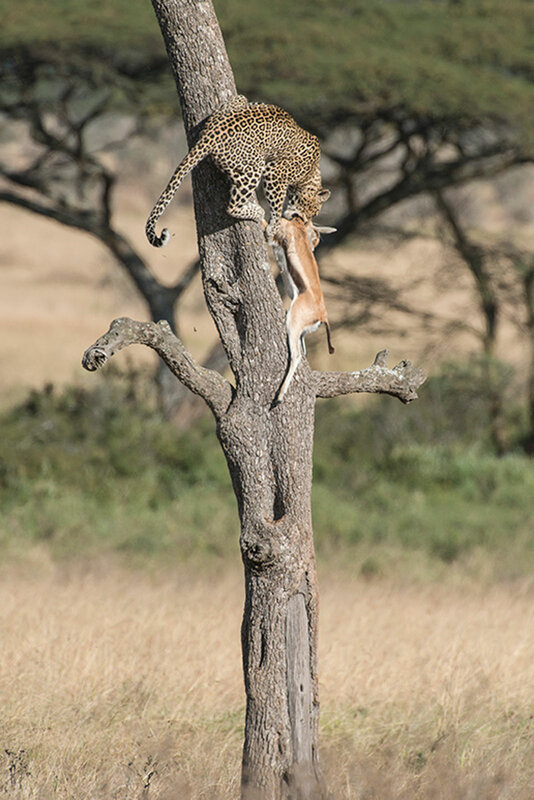 Our game drives require good energy levels, as some days are long. Most travel is in open-air safari vehicles on sometimes dusty and bumpy roads. You may have short walks around camp and lodge grounds between game drives, if conditions permit. Please contact us if you have any health concerns that may make this trip challenging. Unless listed as included, airfare is not included in trip costs. Detailed logistical information and the contact information for our recommended flight-ticketing agent are included in the Trip Materials we will send you. Pleaselet us know if you are arriving earlier or staying later as we are happy to assist you with any extra overnights that you might want to arrange. Flights you (or a travel agent) book: Arrive at Maun Airport, Botswana (MUB) from Johannesburg, South Africa (JNB) around midday on August 6 via South African Airways – we will send details when the airline schedule is confirmed. Depart from Lusaka, Zambia (LUN) on August 22. See separate itineraries for flight detailsif you are arriving from the Meerkats Extension, or are continuing on to the Rwanda Extension. Flights we book for you: Flights from Maun to Moremi, Livingstone to Mfuwe, and Mfuwe to Lusaka. The cost of these flights is included in the tour cost. Is this a safari only for photographers? No, both photographers and non-photographers will have a great safari experience guided by Tom’s longstanding passion for both wildlife and wildlife photography. 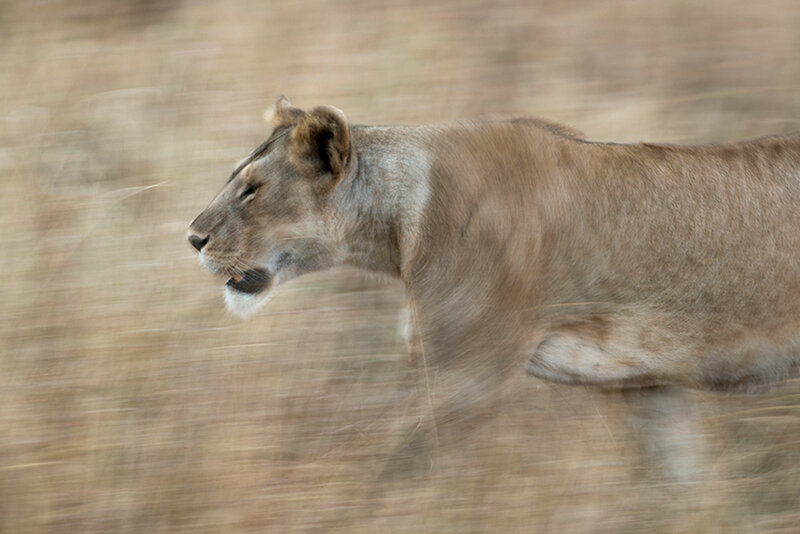 His eagerness to share his photographic expertise ensures that photographers get skillful guidance during the day and one-on-one critique time in the evenings, making this a unique photo workshop safari. Tom’s lofty patience and welcoming personality benefits amateurs and professionals alike. And if you are not a photographer, you have ample opportunity to simply watch wildlife behavior in its most natural environment. How long will we travel in vehicles between locations? The distances between locations vary greatly. Generally, we will travel to a new location after a morning game drive when the animals are less active so you will not miss any action. What is the difference between experiencing Victoria Falls from Zambia and Zimbabwe? We stay on the Zambia side of the falls. Zimbabwe encompasses about 75% of the falls, while Zambia has 25%. During the drier seasons, portions of the falls on the Zambia side dry up. 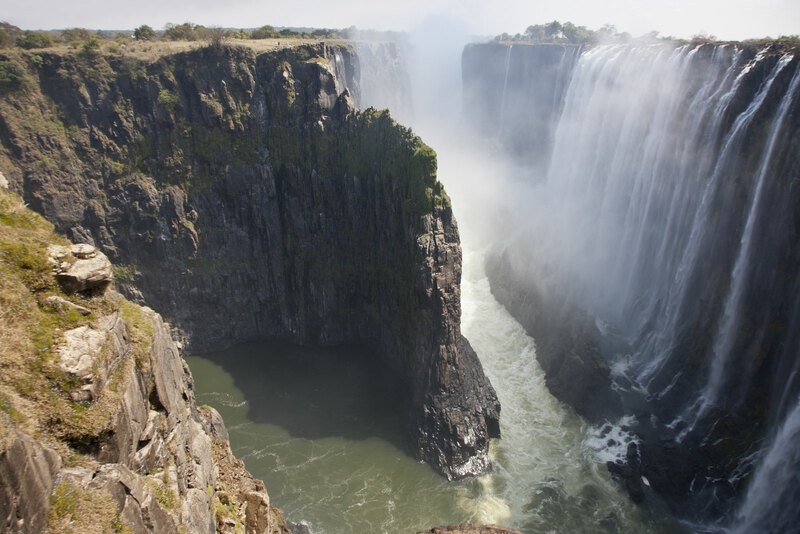 Zimbabwe provides more viewing locations (about 16 overlooks) to give different views of the falls, while Zambia provides a view of the “knife drop” from closer vantage points. Is it dangerous to camp in the “bush” in Botswana? Camping immerses you in nature to give you the real experience of the African bush. You will be safe as long as you follow camp rules that will be thoroughly explained at the beginning of your camping stay. Camp staff is always nearby to assist you and to ensure your safety. Camp in HATAB(Hospitality and Tourism Association of Botswana) sites with no fixed buildings or facilities. Our outfitters handle all camp set-up so you can fully enjoy your wilderness experience. You will be in 2-person tents (9x9ft) with a high roof, attached bathroom (9×7.5ft) with shower (hot water provided), and a covered area in front of the tent (9x7ft). Comfortable camp beds are made up with mattresses, sheets, duvets, and pillows. You’ll dine in a dining tent or beneath the stars depending on the weather. Wine, local beer, and soft drinks are provided. Electricity is not available while in our mobile camps; the safari vehicle has the ability to charge camera batteries. Take comfort in “luxury, en-suite” permanent safari tents and chalets at Flatdogs Camp in Zambia. Each tent and chalet has a bathroom with a hot shower, flush toilet, and washbasin. We travel in one open-air jeep-style four-wheel drive vehicle with rows of seats that provide 360° viewing. Our leader will drive the vehicle. You are on dusty and bumpy roads, so dust protection for your camera and gear is necessary. Blankets are provided but warm layers are essential. "I will never forget seeing herds of elephants cross the Chobe River at dusk to drink and graze. It was especially incredible to see the baby elephants swim with their mothers." "We were treated to a first-rate guide, first-rate chef ,and first-rate crew unequaled in all my previous trips." "First-Class. The mobile camping was far more comfortable than I anticipated. The tents and beds were great and the food - wow!"